Hanging Gardens offers multiple solutions to manage onsite stormwater, i.e. bioinfiltration, porous pavements, integration of native plantings as well as stormwater collection and infiltration. We are well aware that neither of these options offer a silver bullet to consistently resolve all site specific stormwater management issues and needs. 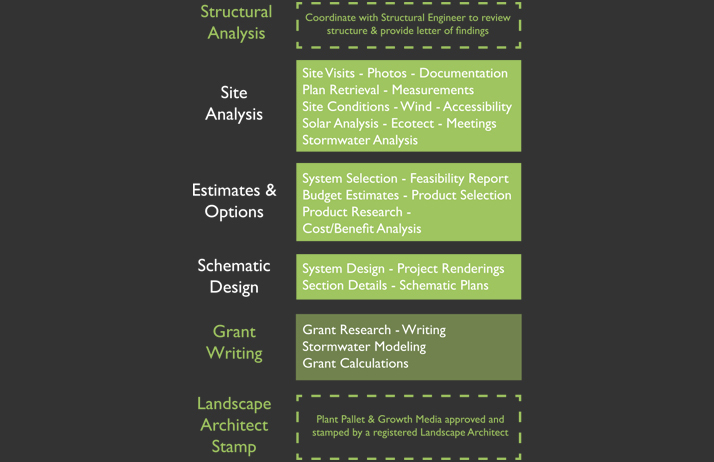 However, in combination these choices provide us with the tools that do meet the unique site specific requirements for all projects, consequently enabling us to provide our clients with the highest value choices each and every time. By imputing data sourced from your site plan and stormwater requirements into our self-developed stormwater calculator, we are able to provide you with the recommendations that will provide you with the greatest value to meet your stormwater needs. Below you will see some examples of systems that have been commonly created from these site specific analyses. 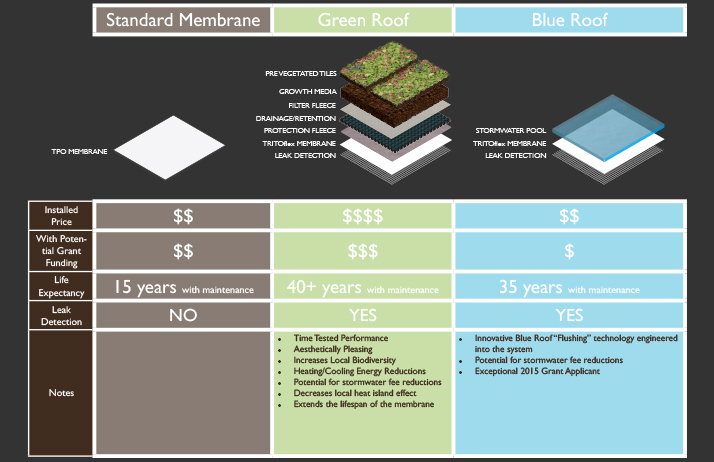 Previously utilized to promote evaporative cooling prior to the age of air conditioning, Blue roofing is experiencing a renaissance that once again utilizes roofs as open-air cisterns for rainwater collection. These systems offer a tremendous amount of water could that can be stored on a building’s roof, given the right waterproof membrane and structural loading capacity. Water weighs 62.4lbs per cubic foot. 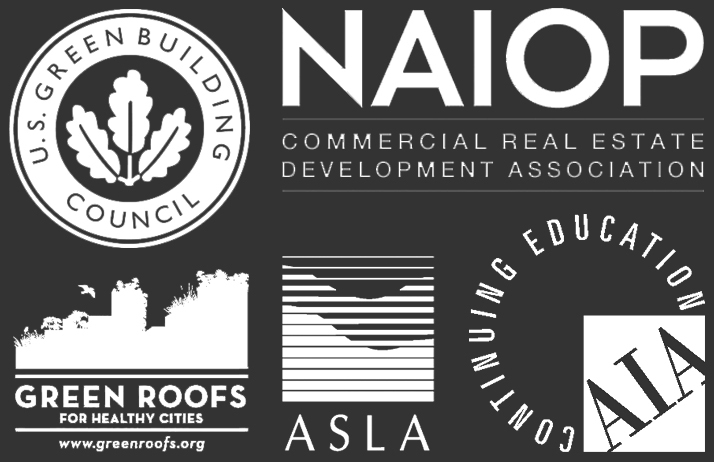 Most cities require that the first inch of rainfall be mitigated on site, which translates to 5.2lbs per inch of depth per square foot on a roof’s surface. Our blue roofs designs have an average depth of 2-4 inches. In addition, we ensure that every blue roof design has multiple fail-safes. This is accomplished through our leak detection systems (link to leak detection), raised scuppers which act as overflows once the roof has reached peak capacity, as well as state-of-the-art roof drains which “flush” the entire blue roof through WIFI technology. Our systems provide volume stormwater mitigation through cost effective performance products and design. Our Permeable & Porous pavers are the ideal stormwater management products for reducing surface runoff and flooding, while maintaining a high strength, durable pavement for pedestrian and vehicular traffic. Porous pavers allow for water to pass through the paver structure, while Permeable paver systems only allow water to pass through the cracks between the pavers. Rain Barrels for the commercial construction and building industry are generally overlooked for water storage and collection because they tend to be too small to be effective for commercial applications. The other issue is that there is no supplier that specializes in rain barrels for commercial sector. Hanging Gardens provides a solution for both those issues. We are the first commercial company specializing in stormwater to offer rain barrels at relevant sizes for the commercial building industry. We offer a line combining over 100+ colors, textures and sizes of rain barrels that reach up to 360 gallon holding capacities. Stormwater Harvesting Cells are structural modules designed with 95% void space to maximize underground water holding capacities and/or infiltration rates. Additionally, the product offers a cost effective alternate to Large Tank Cisterns, the industry norm, with an installed cost of 50-65% of the Large Tank option. Beyond price, our 10 unique Stormwater Harvesting Cells offer a flexible solution that has the ability to take on numerous configurations of dimensions to meet any project requirement.